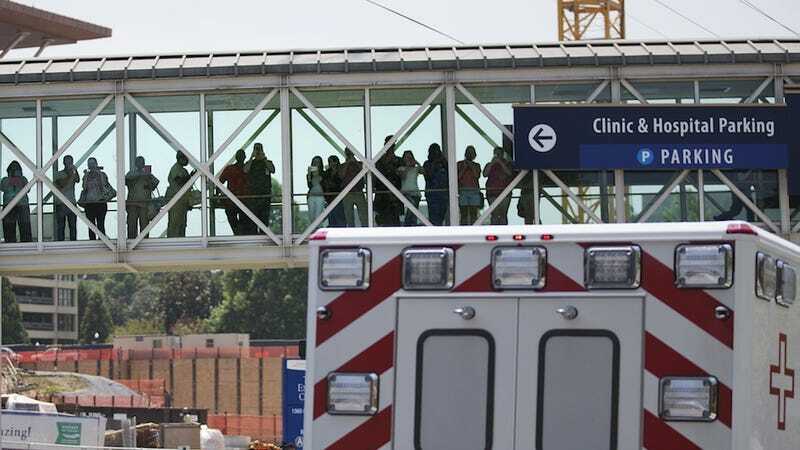 Two Americans stricken with Ebola are being flown home to Atlanta. And apparently, the CDC and the hospital receiving them are getting harassing phone calls and emails. America, please calm down and let these people do their damn jobs. "I hope our understandable fear of the unfamiliar does not trump our compassion when ill Americans return to the US for care," said Dr Tom Frieden, director of the US Centres for Disease Control (CDC), also based in Atlanta. He noted the agency had received some "nasty emails" and about 100 calls from people questioning why the sick aid workers should be let into the US. "I really hate that they had to bring them here, but I guess it's something they had to do," one Atlantan told CBS 11. "If, God forbid, this thing breaks out of the Emory Center where it is — and I understand some precautions have been taken — but nevertheless there is some sort of risk… We've never had this thing on our soil; we don't know what the effects would possibly be," rambled another. Seriously: This is literally why the CDC exists. It's not like the U.S. military is just dumping these people in some overloaded city emergency room and burning rubber out of the parking lot. Diseases don't "break out" of the CDC, because Outbreak isn't a documentary and hemorrhagic viruses aren't George Clooney in Ocean's Eleven. Emory's infectious diseases unit was created explicitly for CDC staffers who might catch something nasty, according to the AP. This, in a nutshell, is why you pay taxes. "For our own situation, where we are able to get good information out, explain how Ebola spreads, where we have isolation capacity and health departments, it isn't a potential of Ebola spreading widely in the U.S.," CDC Director Tom Frieden told reporters Thursday. "That is not in the cards." Just let the CDC and Emory do their jobs. If you want something to worry about, worry about antibiotic-resistant superbugs. Now THAT's scary.